There are quite a few basic components and construction methods which have been used often enough in KSR that we have noticed certain trends as to how well, or poorly, they function. Of course, one man’s “works great” might be another man’s “don’t even try it”! So I’m starting this topic with some examples from my own experience, and then we can discuss such things, and “speed up the learning curve” – specially for new builders. Many racers out here on the West Coast have been using cable steering “forever”, but I had to be contrarian and use rack-n-pinions and tillers. 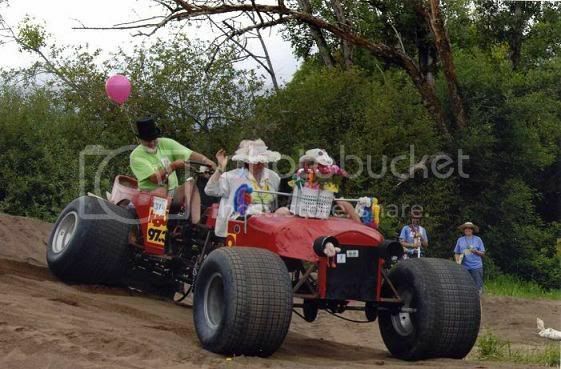 Until… the Beach Party Buggy arrived. This vehicle was built with fabulous craftsmanship by professional fabricators, but they were not vehicle dynamics engineers. I converted the Buggy from four wheels with no suspension to three wheels (which needs no suspension). Once the front fork was mounted, it was obvious that this was the perfect opportunity to try steering by steel cables. I installed a pulley on top of the front fork, and a hand crank between the front seats. Such an arrangement needs a lot of “gearing”, so the pulley up front is something like 9 inches in diameter, and there is no pulley at all on the hand crank – just the ¾ inch shaft itself. And it still could use more reduction. Many racers use a bicycle rim for the pulley. Installing this, the cable needed to be wrapped many times around the shaft, and I tried to wrap it in a tight orderly spiral. But this cable was too stiff, and I wound up happy that the cable stayed on the shaft at all while I tightened the turnbuckle. I left it on the loose side, because the cable would obviously be “tripping over itself” when I turned the handle. Guess what…? It worked great, right off the bat! The cable is slowly being chewed apart where it goes thru the hole in the shaft, but this can be easily monitored and the cable replaced as needed. The slack I allow in the cable so it can wrap over itself on the shaft without over-tightening causes no trouble at our low speeds. Many racers use differentials on their drive axles. And, mounted correctly and not overloaded, they can do the job. But they have the drawback of allowing one wheel to spin, while the other does nothing. (That why many of us like to have “PosiTraction” on our cars and trucks.) We have also seen that novice builders often fail to mount differentials correctly, and they soon break. So I’m very much in favor of independent drives. That means, no mechanical connection between the left and right drive wheels. The riders on the left drive the wheel on the left, and same on the right. This also helps with turning in mud and sand. 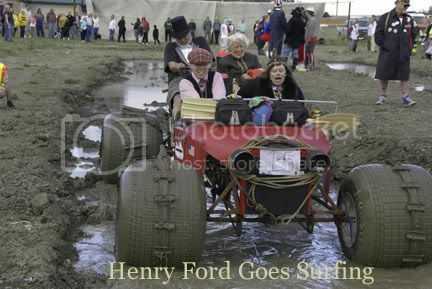 This “4x4” version of Henry Ford Goes Surfing worked very well. Four riders, each powering one wheel. Steering is by center articulation, which eliminates wheel alignment issues. Yes, I’m steering from the back seat – the parts just happened to fit best that way. There is no substitute for tall wheels. Basically, taller is better. It doesn’t matter much on pavement, but boy-howdy it makes a big difference in mud and sand. This was my first KSR effort. The front wheel is eight feet tall, the rears six feet. It rolled over curbs and exposed railroad tracks like they were not there. In rough terrain, wheels that are not driving you forward are holding you back. “Henry” again, with mud cleats strapped onto all four wheels. To my own surprise, we made it thru the Dismal Bog in Port Townsend, even with modest muscle power. ALL the power went to propelling us forward. Chain wrap is how we describe how much of the sprocket is in contact with its chain. Quite simply, more is better. Chain wrap is the key factor in keeping the chain from skipping over the sprocket. Any less than close to 180 degrees of wrap is an invitation to skipping. Install fixed idlers (on the slack side of possible) if you need to increase chain wrap. Finally, the most basic element of structural integrity -- triangulation. Sure, you can build with material that is stout enough to do the job by itself, but if you are building anything like a box or truss with small tubing, you should make sure there are no rectangular sections. All you need to see this for yourself are four pencils and some adhesive tape. Lay out a rectangle, and you can change its shape. But lay out a triangle, and it cannot take any other shape. Ever been in an old house with warped floors, and a four-legged table teetered back and forth? Same with vehicles. 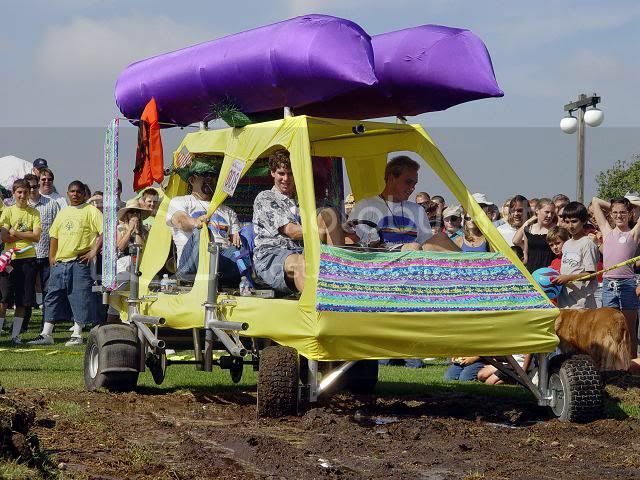 A four-wheeled vehicle without suspension works well only on a flat surface. Scroll back up and look again at “Henry” coming down a sand dune. Notice that the terrain forces the vehicle to twist quite a bit. This vehicle happens to have suspension by center articulation, but one way or another you should have a mechanism that allows all four wheels to follow the terrain. …has the biggest diff I have seen in the sport, yet it detonated in the Dismal Bog. I had provided very low gearing, for four very strong riders. Bang! The diff housing split in two. I’ve seen some fabulous capsizings. (Regrettably, I lost the pictures in a computer crash.) You can have some of your water floatation under the vehicle, but you must have plenty of it outboard so you cannot tip over. If you are connecting two or more riders, you may think that they can synchronize their pedaling. Yes, tandem bicycle riders often do this, but it takes a lot of practice. In a one-shot deal like a KSR, with assorted untrained riders, forgettaboutit. I watched a rider get a seven-stitch gash in the back of his leg when the man behind him started pedaling before the man in front was ready. I’ve tried riding such a machine, and most of the energy went to “fighting” each other and failing to get synchronized. And we often need to take a short break from pedaling. So each rider must have his own freewheel. This is the propulsion system I built for my kinetic sculpture. The power input shaft on the independent propulsion unit, IPU, uses the same type of bicycle cassette as the power output shaft; however the cassette’s orientation is flipped 180°. The axes of both cassettes are situated so they are parallel to each other and a single loop of chain links them together in any one of five different sprocket combinations; thus providing a number of gearing options. This arrangement is identical to the system on a Bridgeport vertical milling machine used to change the headstock speed. A Bridgeport uses two stepped pulleys and a drive belt. My version uses two stepped sprocket cassettes and a drive chain. A spring loaded idler pulley provides guidance and tensioning of the chain connecting the two sprocket cassettes. Once power reaches the IPU it is transmitted forward 6″ longitudinally along a short jackshaft to a 12 tooth sprocket. Power is then directed downwards 26″ with an enclosed loop of chain that goes down to a second jackshaft having an identical 12 tooth sprocket. Power is then transmitted rearward 10″ to a 16″ diameter two bladed propeller with a 24″ pitch that extends out the back of the IPU. Both of the chain’s sprockets have aluminum flanges to either side to enclose the chain and prevent derailments. Both jackshafts spin on ball bearings contained in the ends of two cast iron T-fittings joined together by a length of black iron plumbing pipe. This pipe assembly serves as the main vertebrae for the IPU. It supports the bearings and shafts, a mounting plate, and a hydrodynamic water foil. This foil encapsulates all the submerged mechanical elements within a foam inner core. The outermost boundary of the foil is encapsulated by thin wooden yardsticks bonded to the foam. This wooden shell was then sheathed in fiberglass cloth saturated with epoxy resin. This provides a hardened skin that protects the inner mechanisms and delivers a streamlined shape that allows water to flow efficiently around this submerged appendage. The bottom 4″ is removable to allow servicing of the submerged bearings and shaft. My first attempt at building a propulsion system was of a much more modest design. It was fabricated from an old exercise bike that had a section of steel plumbing pipe welded to the bottom bracket where the pedals, crank, and sprocket were housed. This pipe extended downwards to a Tee-fitting where two ball bearings supported a keyed shaft having a 10 tooth sprocket and homemade propeller attached to either end. The axes of the exercise bike’s crank and the propeller shaft ran parallel to each other. A long loop of chain scavenged from an automatic garage door opener connected the upper and lower sprockets. Chain guides were fabricated from recycled nylon cutting boards. Wooden planks were fastened to the bike frame to support the weight of the pedal station and crew member. The propeller extends into the water. The homemade propeller was made with steel plate bolted to a keyed pulley. The propeller shape and pitch was determined through research done by my friend and crew member Drew who took an interest in propeller design. He produced a template, cut out the shape, and then bent each blade to impart some pitch. This propulsion unit had no water foil around its submerged components which resulted in a lot of drag from the submerged components. Water served as the lubricant for the chain and lower bearings. After each use the unit was completely disassembled and dried to displace water, and then biodegradable lubricant in the form of vegetable oil was applied to prevent oxidation between uses. The most effective pedal cadence at the bicycle crank was 60 rpm which resulted in a propeller speed of 276 rpm. The prop was 14″ in diameter and had 9″ of pitch. About your input gearing. No Bridgeport mill needed to explain; it’s the same system as on my cheap little benchtop drill press. And you may be able to shift it on the fly with a derailer – Mike Saleski does that on Tiki Bar, and I think Allen Brown built such an arrangement on Sojourner. Now the unit itself. Forgive me but… do you travel sideways in the water? Or do you sit sideways on the machine? I see no 90 degree twist. With 26” of depth (length, center to center), a bicycle chain will happily twist 90 degrees and more. 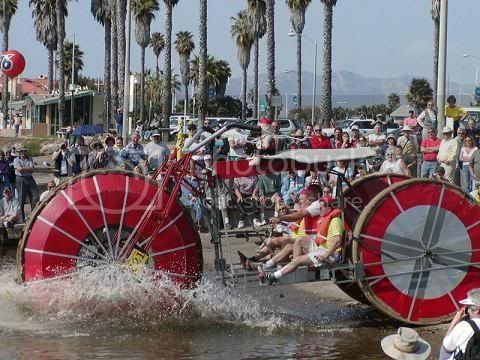 This is common – twisted chain drives that resemble yours are in use by the Human Power Boat Racing people. I built one (prototype, so far) that steers like an outboard motor. And Dave Hershberger has such a twisted chain drive on the steering tail wheel of Smile. I love the way you utilized common plumbing supplies. And the chain guides. Keep up the good work! The propeller is powered by two crewmembers seated in semi-recumbent positions facing forwards in the direction of travel and using their feet to push on bicycle pedals. The muscle power from each crewmember goes from the pedals and through a transmission that converts human power into a rotating motion and torque that causes the propellers to spin. The crew’s seating positions are situated side by side and spaced apart 36″ by their centerlines. Each seat’s backrest is angled backwards 45°. The chairs are made out of aluminum tubing and have a flexible canvas cover that conform to the body and includes armrests; this provides a relaxed and comfortable seating position. Each seat can be moved fore or aft and then locked into position to provide an essential ergonomic adjustment that allows crewmembers to set the proper amount of leg extension distance between their seat and a bicycle style pedal station. This optimized body position allows the crew to generate maximum power. Directly in front of each chair is a pedal station made from three identical extruded aluminum sections welded together to form a triangular frame. Metal tubes are fastened against the topmost corner of the frames and house bearings and one-piece Ashtabula bicycle cranks with 52 tooth sprockets. Wooden gusset plates are bolted to the rear of the frame and act as stabilizers and incorporate nylon chain guides for the main sprockets. Chains run forward from each of these sprockets, through the chain guides, and down to two separate 11 tooth sprockets mounted to opposite ends of a main driveshaft. This shaft unites the power from both pedal stations and is composed of two separate 5/8″ diameter shaft segments joined together by a cushioned urethane driveshaft coupler. The coupler absorbs load pulsations from the pedals and minimizes the stresses introduced by moments of shaft misalignment. At a midpoint in the main shaft there is a miter gear arrangement that transfers power 90° to a secondary shaft that runs rearward 18″ and between the two pedal stations. A Shimano 10-Speed bicycle cassette is attached to the opposite end of this shaft and provides five gearing options composed of a set of 28, 24, 21, 19, and 16 tooth sprockets. Each of the three shaft segments rotate on sets of two self-aligning ball bearings mounted in pillow blocks and elevated along a common plane atop wooden risers. The outboard risers supporting the ends of the main shaft also incorporate chain guides for the smaller 11 tooth sprockets. All sprockets, bearings, and coupler hubs are keyed to the shafts and/or locked into place with set screws. The miter gears are secured to the shaft with spring pins. All of the sub-assemblies that make up this transmission are mounted to a common base plate attached to the deck. The function of this apparatus is to transfer muscle power from the two pedal stations to the power output sprockets, this being the Shimano 10-Speed bicycle cassette. These are the pedal stations for my kinetic sculpture before they were entombed by three feet of snow and ice. This is the connection between the power output shaft's sprockets, in the rear, with the power IPU's input shaft's sprockets, in the front. The spring loaded idler wheel is not installed in this picture. Aha, there is the 90 degree bevel drive -- on the (what I call the...) collector shaft. It had to be there somewhere! Sir, you are fabricating mechanical jewelry. I salute you! Here is a real good shot of the spring loaded idler wheel apparatus that tensions and guides the short loop of chain between the power output shaft and input shaft of the IPU. This is a skateboard wheel with a grove machined into the center. The spring loaded function is provided by bungee cords. Spring loaded idler wheel assembly used to tension and guide the chain. I bet you keep that wood well waxed so it will slide freely! Very nice. Now... does that whole tensioner assembly move sideways to change gear ratios? 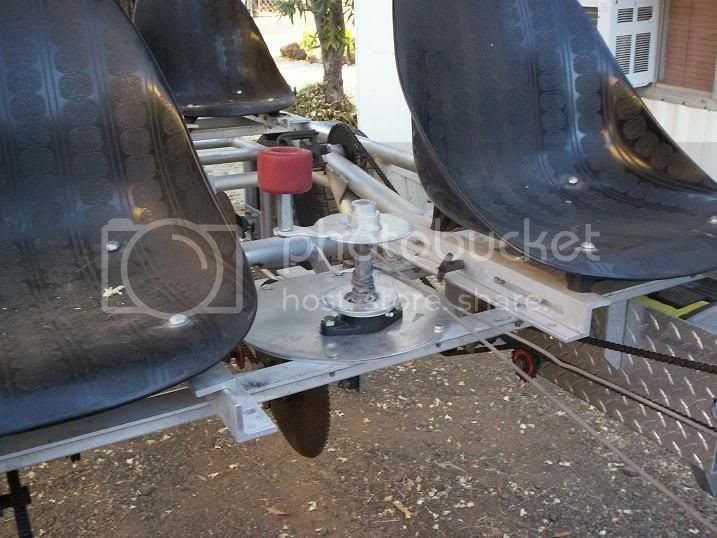 The Idler is clamped to a backstay which is fastened to the last riser plate & pillow block before the sprocket cassette on the "collector shaft". The spring loaded idler has a slit in it for the chain to run through plus a grooved skateboard wheel. What we typically do is select the middle two sprockets and run the short chain loop between them. The idler is positioned to the desired spot and clamped into place to tension and guide the chain. Both of the sprockets in the middle of the two cassettes have 21 teeth so this provides a 1:1 ratio. The pedal cadence is 60 RPM's with a 52 tooth sprocket running to an 11 tooth sprocket which runs the collector shaft at 284 RPM's. Since the miter gear set is identical the 1:1 ratio carries thru and there is no increase in RPM's to the propeller which spins at 284 RPM's also. We have found no need to switch gearing while underway because the gearing choice we use seems to be ideal. Remember this is the gearing for the propeller only. If we move up or down a gear set on the cassettes the pedaling is either way too easy (prop spins at 225 RPM's) or way too hard (prop spins at 358). Either way this is not a good impedance match. The idler is simply unclamped, slid over, then re-clamped if we want to change the gearing. What we really need to do is find sprocket cassette stacks that go up in size by one tooth increments as this would provide less abrupt gearing changes. The system is virtually bulletproof the way it is with no derailments. At first we were using a BMX chain for our loop of chain connecting the two cassettes. This chain was too wide and the ends of the chain pins were catching on the adjacent sprockets. Once we switched to thin ten speed chain that problem went away completely. In regards to your comment about waxing the wood to keep everything sliding. Actually I just left lots of clearance so all the fits are super loose on the idler mechanism and I also sanded all the mating surfaces super smooth so everything slides freely. This is a good picture showing the spring loaded idler clamped to the backstay. The orange clamp provides the clamping force. The lighter colored piece of wood fastened to the last riser plate & pillow block before the sprocket cassette on the "collector shaft" is the backstay that the spring loaded idler is clamped to. Taking a page from Elliot's design manual, I incorporated "wagon brakes" on my new machine. They consist of a 1-1/4" dia. conduit crosstube hung from the the machine's frame rails with short sections of angle iron. The angle irons are welded to the crosstube and pivot on the bolts that hold them to the frame rails. For brake shoes, I just used sections of angle iron, again welded to the ends of the crosstube. To actuate the brakes, I have a 2' long lever made of 1" conduit that pulls on a 3/4" conduit linkage. Super simple, but MAN DO THEY WORK! I didn't think raw steel rubbing on bike tire tread would generate much stopping force. So I decided to test them. 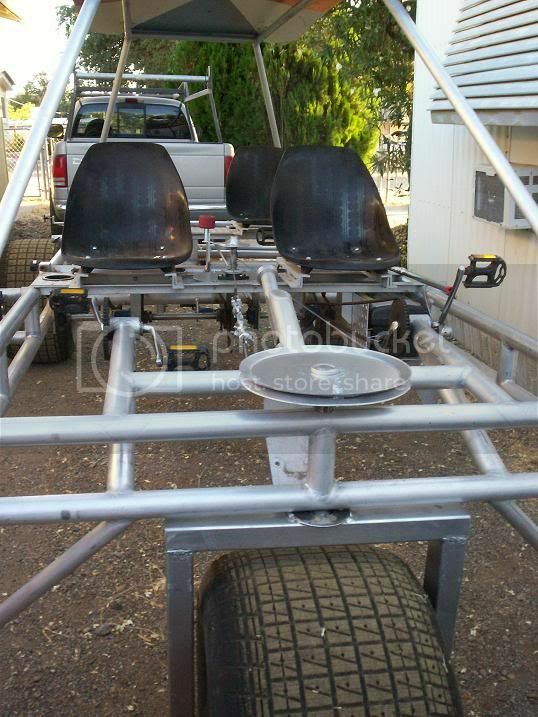 I pedaled my 600-lb 4-man tadpole trike up to 10 mph and slammed on the brakes. Bad idea. Newton's law kicked in and the machine pitched forward lifting the rear wheel a foot off the ground! The near-header was terrifying (my seats are 4' off the ground and the machine is the size of a pickup truck). But I stopped in less than 20 ft. I may yet kill myself and/or my passengers, but I won't be killing any mayors! Ditto! It doesn't seem like it should work this well, but it does! My steering forces are relatively light so I used a 3/32" cable with a load rating of 233 lbs. To get around all of the drivetrain, I used 7 or 8 cheap little 2" pulleys that I got at a flea market. The steering shaft is a chunk of 1" conduit welded to the end of a cut off bike fork. I used a bike headset (mounted upside down) as a pillow block bearing since I had it. And my steering wheel is just a gutted 20" bike rim with spokes made from a cut up bmx handlebar. So far, so good. 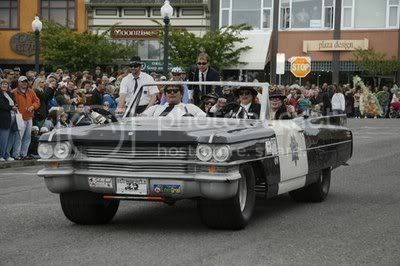 Our first public ride is in a parade this weekend. I'm crossing my fingers and praying that nothing breaks and I don't harm any of my passengers. Now the unit itself. Forgive me but… do you travel sideways in the water? Or do you sit sideways on the machine? I see no 90 degree twist. With 26” of depth (length, center to center), a bicycle chain will happily twist 90 degrees and more mutuelles Entreprise. This is common – twisted chain drives that resemble yours are in use by the Human Power Boat Racing people. I built one (prototype, so far) that steers like an outboard motor. And Dave Hershberger has such a twisted chain drive on the steering tail wheel of Smile. Very beautiful invention, it is as if we were already in the future and that everyone was rolling with these machines there. Aha! This thread was resurrected! From my end, it seems the photos have disappeared, but that's no doubt my fault. Reckon I will read this all over again, as my memory from five years ago has perhaps also faded a tad. But not today, or even tomorrow, since I am a wee bit busy. Klamath Falls, Oregone, KSR in less than two weeks, and I have tons of fabrication to do!